Many of you know that I occasionally have pimple breakouts. I've had a good luck finding the right regimen to control my nasty pimples but from time to time I still get a few of them on my face. Stress, diet, pollution and hormones play a big part on having pimples. Anyhow, I get to tame them. I'm more focused on the scars, the ugly marks these pimples leave on my skin. So yes I've tried so many scar removal creams, whitening creams, etc to solve the problem. I've tried many expensive one and of course the natural home remedies to erase scars. But still Im not satisfied. So then, I tried my luck with Maxi Peel Exfoliant Cream! I've heard so many good things and a few negative ones about Maxi-Peel Exfoliant Cream. And this time around, I got to try it myself. So, I used the Maxi-peel Exfoliant Cream # 1 first. Then I moved on to Maxi-Peel Exfoliant Cream #2 up to this writing. And I plan to use Maxi Peel Exfoliant Cream #3 for really stubborn scars. It's a cream which I prefer than using the solution, because I get to evenly apply it on my face. The smell is just fine. My face didn't turn red. There is no visible peeling even after a few weeks of usage. Scars seemed to lighten after 2 weeks. If there are pimples they seem to heal faster. Cheap at only 59 pesos up. I am not really satisfied with the "exfoliating" effects of the cream on my face. I expected the cream to do better. The pimple scars did lighten up but it's already almost a month of usage of this product but still I'm not getting the flawless complexion, scar free skin I'm looking for. I was expecting too much perhaps. But I know another product that works better than this cream in such a short period of time, per observation from other people. I started using #1, but felt it was too less effective, so I used #2 instead. But still am not satisfied. Hence, I will be using #3 soon enough to see if I'm more "hiyang" to it than Maxi-Peel Exfoliants #1 and #2. I will keep you posted then. If you have tried using maxi peel exfoliant cream please share your reviews here. Do comment below :) . Till next time. UPDATE: Maxi Peel Exfoliant Cream Review Part 2: Effective ba? How many days or months before you saw the results? I'm on my 12th day, and I suddenly had breakouts. Is it normal? Im using exfoliant cream no. 2 and it's working for me. Ive used it for 2 months now. At first I had breakouts too! Pero they dried-up and lightened and nag-clear naman ang skin ko. I'm using no.3 right now and sana naman effective ito sakin. Hopefully! dae ko na kasi na-try. I tried using #1 and loved the effect on my skin. my pimples seem to dry a lot faster, and i can see the red spots becoming lighter. I also love how flawless my face feels when i wake up in the morning after applying the cream the night before. Can I use Maxi Peel Solution in my lower legs? My miracle exfoliant. Pimple free face. Loving it! Be patient lang! 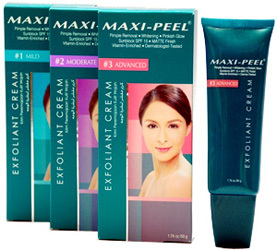 I used maxipeel exfoliant cream #1...and it really works,,,sometimes i tried to use other product,but its not effective,,yet still im back on maxipeel its hiyang tlaga.. It also works better if you'll use Maxipeel Pore Refining Skin Toner before applying the cream for it will really make your skin smooth and blemish free. Try also using their Soap for faster results. Ginagamit kna yung #1 sobrang effective, natanggal na yung iba kong flaws. 2-5 days sya bago magdry yung mga "hinog" na pimples ko. Lol. Kaya ginagamitan kna lang ng hydrogen peroxode para magbukas agad yung pimples. ★★★★★ sya sakin! Ewan klang kung gaano ko katagal syang gagamitin.. kasi nabasa ko masama rin yunh nageexfoliate plagi. If i started to use this. Hindi ba sya magbabalat or mamumula ? Is it okay to use number 3 exfoliant mixed with the toner then after i'll use the exfokiant cream number two? I have an oilyand acneprone skin. I have lots of scars also. Yung #1 palang ginamit ko. Kakabili ko lang sya kagabi so sana magwork!! Anu ba dpat kung gamitin pra matanggal pekas q? Pwd b khit cream lng nkakatakot gumamit solution eh. #2 pra lalong mg clear n tlga ok n ok skn nid lang tlga ng patient pra ma achieve. Pano po ba yun gamitin? #1 is fine for me po. Effective and it dries my pimples as fast as 2 hours of usage. Normal lang po talaga yung nagkakapimple kayo kapag gumamit ng solution. Kasi nilalabas nun yung excess oil sa balat na pwedeng maging pimples sa future. First time po mg use ng maxi anu po bang # ang unang gamitin? pwd din po ba to gamitin sa legs old scars?